A cookbook and guide on how to have a family dinner. Is that what America has come to? Many books now tout bringing the family back to the table. They are full of recipes, conversation starters, and tips for turning off electronics because evidently we families have forgotten how to cook, talk to each other, and find the off button. And I don’t know where we have gone. Where does everyone eat? Yes, I am that naïve. I do have dinner with my family every night. I know I’m lucky to have a husband who gets home at a reasonable hour, but even when he’s late, I eat with the kids. We sit down to a meal that I cooked and we talk about our day. Sometimes we eat, laugh, and have a Hallmark moment. It may not be a fancy meal. It may have come from a box. Or maybe I spent time making everything from scratch only to have my daughter shrink into a fit of tears and my son take a bite and whisper, “This is disgusting.” The kids may fight about how many carrots they must eat or who gave them the stink eye, and I always nag at them to get their elbows off the table. Who would want to miss all that love? Put those kids to work. 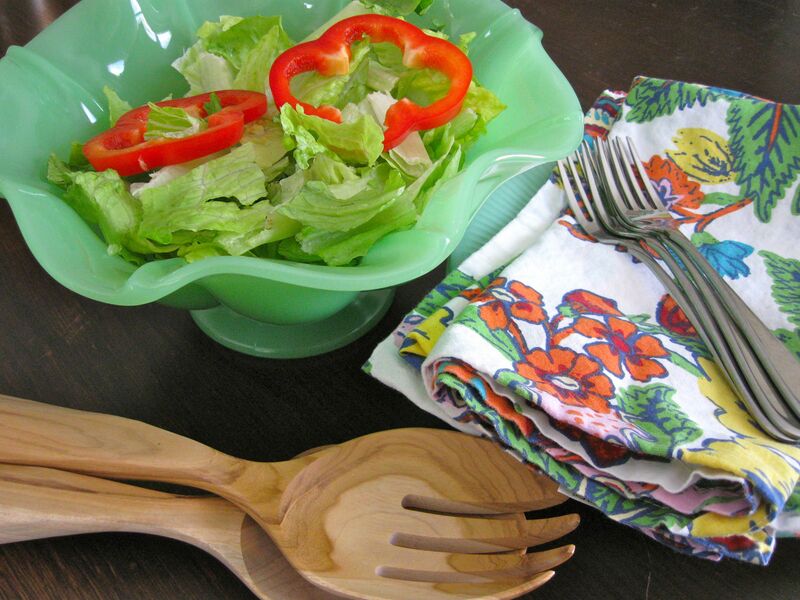 They can make a salad and set the table. Woohoo! When we have sports practice or Scouts, we just eat earlier. It’s tricky. It takes effort. We run late. We rush to the van in our socks. But some of my funniest memories of childhood include dinnertime with my family. I sat and poked peas around my plate and slipped lima beans to my dog when no one was looking. I griped about tough, chewy pork chops or the fact that the last of the macaroni and cheese was gone. Or I got up from eating my dinner and made myself another meal while my family watched in horror because I had the appetite of two teenage boys and a tapeworm, they were sure. My sister and I used to taunt each other across the table about how quickly we were developing. We’d tease each other about bra size and make our father so uncomfortable, he’d sometimes gulp his dinner and forgo his usual seconds. We joked about kissing boys with no lips and big ‘80s hair. And the evening culminated in a chase around the kitchen when my sister realized I never participated in dishwashing. Those were good times. Dinnertime may not always be easy. My kids fight. My daughter picks and squirms. But my kids turn on some of their best comedy acts at the table when they know they have a venue. Sure, we have to endure the world’s lamest knock-knock jokes, but every now and then, somebody says something that makes me choke on my baked ziti. Make something from scratch. 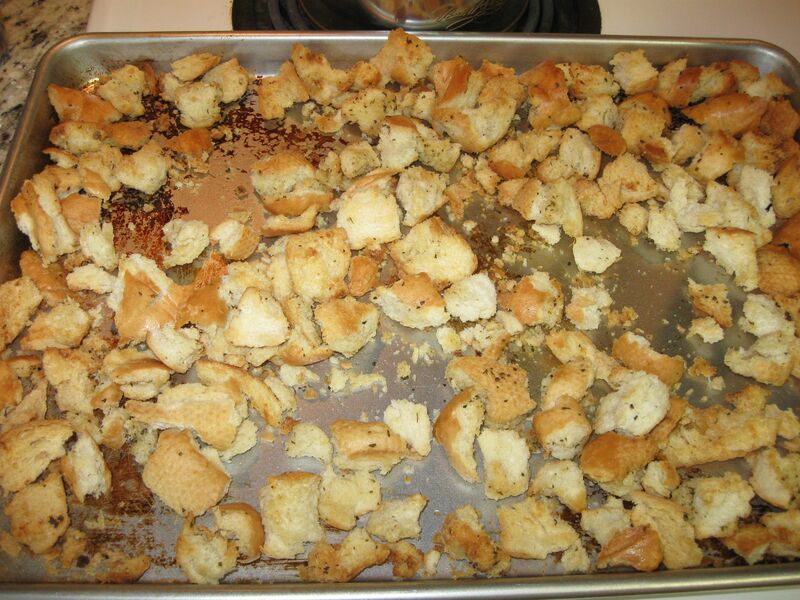 Your kids will ask questions like, "Where do croutons come from?" And of course it’s always the time the kids choose to bring up the most inappropriate topics, like the poor guy who has to carry the shovel behind the elephant at the circus. My husband doesn’t miss a beat though, pointing out that that’s why it’s important to go to college, so you don’t have to be a human pooper-scooper. Always thinking, he is. So to anyone who needs advice on how to have a family dinner, I offer it here for free. You don’t need a book (unless you can’t cook, then by all means go get a cookbook). Skip the drive-through. Make a meal for your family like your mother did. Eat at the table. No TV, no phone, no devices. Just people. The conversation will come. You don’t need little cards telling you how to talk to people. I promise. This is so true. I cook meals everynight for my family and we sit and the table and enjoy good food(sometimes cooking gone wrong) and witty conversation. I ate dinner at my friend’s house the other night..the tv was on, their kids eating shoveling foods into their mouths so they can play xbox or get on their phone. I was horrified. I admit I spend a lot of time with my kids, but in spite of my making fun of our daily struggles on this blog, I really actually kind of like them. I learn oh so much at the dinner table! Thanks for stopping by! Love it!! And I agree wholeheartedly. I absolutely love the humor in your posts and your approach to parenting. Is it okay to link to this post, if I should write a future post on family mealtime?? I would love to share this! That sounds like a fun house. Think of all the great memories being made. I love this post!!! We also sit at the table as a family every night eating a meal that I “attempted” to prepare. It’s been a struggle at times to get our now 4 year old to behave and lots of the time he doesn’t like what we’re eating… But, it is SO important to start this ritual now. No electronics either!!! It really is quite sad that more people dont eat at the table and talk anymore, whats even more sad is that someone actually published a book on how to do this. My wife is wrapping up nursing school this yea,r and has taken the night courses so she can be home untilI I get home, yup we make it work with no babysitter. So I do most of the cooking and cleaninig because I want her to focus on school, and I like cooking (but nobody likes cleaning haha) but we do eat at the table and if my wife has school during dinner(which is four nights a week) its ready for her when she returns. Thanks. It’s all about effort. Like I said, it’s not always easy! Some days, I do want to turn in my griddle, but I trudge on. Being creative in the kitchen and having fun with good old standard recipes is one of my favorite activities. My family have not complained yet! I enjoyed reading this article. We always eat dinner together too. Sometimes it’s at 5 and sometimes it’s at 7, but we work around everyone’s schedules and eat at the table. The only who misses is my husband and that’s rare; however, sometimes he has to work so late that we just can’t wait. It’s not the norm though. Conversation starters is just a funny idea. Why would we ever need those? The conversation starters was really the kicker for me. Does a family really need that? My kids may not say appropriate things but conversation is never lacking! lol. Usually I’m begging my kids for just a moment of silence…just one moment. Good for you! When I was a teacher, I was shocked at how many young people did not sit down as a family at the dinner table. We always did when I was growing up, and I carried that tradition to my family when we had children. Even when the kids were in high schoo and had to get to rehearsals and practice, we tried to schedule time to eat together whenever possible. It’s so important. I know. I just thought it was what everyone did. My family always sat together for dinner. We always gather in the kitchen, it is the heart of our home(s). It is tricky with little ones, but it is more than worth it. We always try and sit together as a family for dinner! It can be tricky at times with such a busy schedule, but so important!! Yeah I have to agree with you I’m confused why you need directions to do something as simple as that. We’re not that great at doing it, we try to at least once a week but our work schedules often have us home between 6:30-7 and my daughter goes to bed by then an honestly making dinner is the last thing I want to do! I with I had your dedication! Wholeheartedly agree! This was always preached in my family growing up. My husband’s family not so much. We plan on instituting this with our family (daughter is only 8 months old right now). Love! Yes, I’ve read that too, that it doesn’t matter which meal. Excellent point! Thanks for bringing it up.